Standard rooms come with a comfortable single queen bed, ambient wardrobes, workstation, LED tv with satellite connection, toiletries for grooming and other amenities. 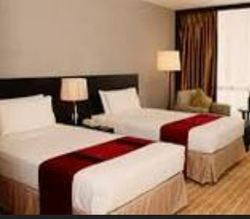 These rooms are ideal for extended stay for any corporate executive. · Every room features a wide range of equipment for your comfortable stay. Deluxe rooms are designed for your comfort and relaxation.